Steering a steady ship with the right answer were Kara and Cheryl. 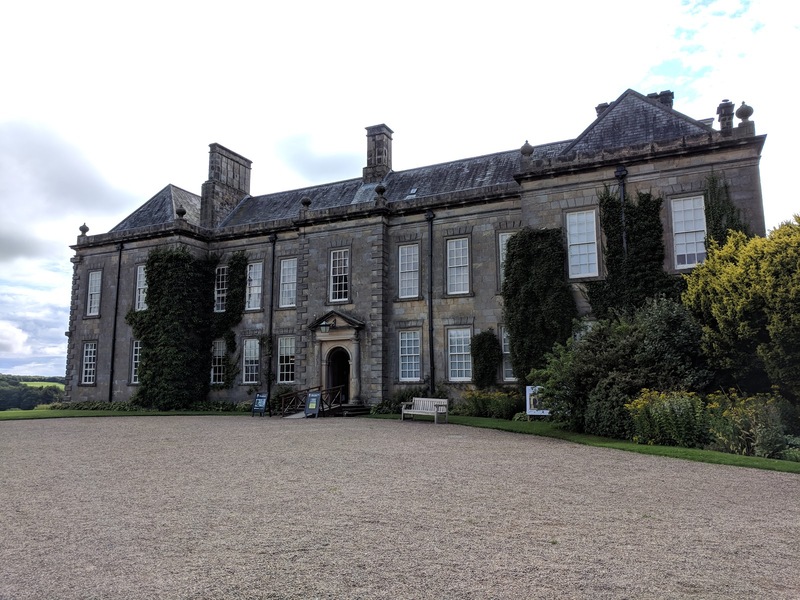 This week we are staying in Northumberland with a trip to Wallington Hall. The estate has passed through several families and owners over the years. The main house has been rebuilt and remodelled before eventually coming into the hands of the Trevelyan family. In 1928 the owner of Wallington, Sir George Otto Trevelyan, died and the baronetcy and the estate passed to his eldest son, Sir Charles Philips Trevelyan. Sir Charles, like his father, was a Liberal MP. One of his appointments was the Parliamentary Secretary to the Board of Education with Asquith as prime minister. However, he decided to resign his position in the government due to his opposition of the country going to war with Germany in 1914. In the 1918 general election he ran unsuccessfully as an Independent Labour candidate before being returned as a MP in 1922 representing the Labour Party. At this time he hadn't succeeded to the Trevelyan baronetcy but his family background and as heir to a title and an estate he didn't seem the natural choice as the voice of the downtrodden and working classes. In truth as the years went by his political views became more and more left-wing to the extent some wondered whether he was actually a communist. In trying to find a balance between being a committed socialist and a member of the landed gentry he made the decision in 1937 to disinherit his eldest son. He announced that he had given Wallington and the surrounding estate to the National Trust on the understanding that he and his wife would still be able to live there until they both died. In a radio broadcast he explained his decision, “To most owners it would be a terrible wrench to consider alienating their family houses and estates. To me, it is natural and reasonable that a place such as this should come into public ownership, so that the right to use and enjoy it may be forever secured to the community. As a socialist, I am not hampered by any sentiment that the place I love will be held in perpetuity for the people of my country." Sir Charles died in 1958 and his widow, Lady Mary or Molly as she was known, lived at Wallington until her death in 1966. In 1968 the National Trust opened the house to the public for the first time. There were many criticisms of Sir Charles' decision to hand over Wallington as some saw it as a way to live in splendour while allowing the National Trust to pay for the upkeep. Despite being a married man with six children Sir Charles had instilled his personal secretary who was also his mistress and their son in a house on the estate. At the time of his son's birth in 1943 Sir Charles was 72 and his mistress, Edith Bulmer, 39.
Who was the first Labour Prime Minister that Sir Charles Trevelyan served under? We were joined last week by Susan and a trip to Disney on Ice. Kara has been down to Portland Bill and watched Wicked. There's been some eyeing up at Cheryl's. In Japan Minoru has been capturing the planes over Tokyo's Gate Bridge in the day and night. Halloween is providing some inspiration for Soma. Anne has had a smashing bad time this week. Finally, Jesh has been marvelling at the wonder of bridge building. If you want to join in with this week's Sunday Snap then add your link to the linky below. Any theme is allowed. It doesn't have to be published today as you have until 23.55 on Friday 19th October 2018 to join in. Grab my badge below for your blog post. Just make sure it is your photo and you hold the copyright for it. Great read! A guess here - Ramsay MacDonald. You caught me out last week, I've always thought it was Navy not National! I think my hubby would have put me right. This week the answer is Ramsay McDonald, I remember learning about him at some point, although politics has never held much interest for me.